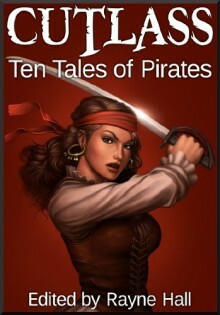 A story collection with ten thrilling adventure yarns, edited by Rayne Hall.Pirate stories are exciting. They give us a taste of adventure and daring, of freedom and romance. While historical reality was unglamorous and brutal, in fiction, we enter a world of excitement, set sail for a great adventure, enjoy freedoms outside the confines of society and law, fight on the side of righteous rebels or defeat the villains and find buried treasure.This story collection contains ten pirate yarns, some spiced with sprinkles of realism, others peppered with fantasy, all seasoned with the salt of adventure. While this is a fiction book for adults, the stories are suitable for older children. To reflect the authors' individual voices, you will find both American and British words and spellings in this book. Some stories have been previously published in magazines, ezines, story collections and anthologies.1. KHABALLO by Margo LerwillCareened on a cursed island, the old captain and her men are caught between warring navies. 2. VICTORIA AND THE IRONCLAD by Douglas KolackiAn escaped slave and a pirate captain race to capture the Confederacy's ultimate weapon.3. BLIND MAN'S BLUFF by Jonathan BroughtonThe trickster's reward is deceit.4. SKRITCH by John BlackportYour enemy may be your best ally.5. DIAMONDS AND BONES by Kris Austen RadcliffeIn space, you may need to deal for the diamonds your bones need.6. UN HOMME DE COULEUR LIBRE by Liv RancourtFate sets Robert's life on a new course.7. SCYLLA AND THE PEPPER PIRATES by Rayne HallA spunky young woman sets out to rescue her long-lost lover.8. BROADSIDED by KJ KieganLove can take you off course.9. THE PENSIONER PIRATES OF MARINE PARADE by Jonathan BroughtonRebel pensioners revolt.10. THE BOOK OF ADVENTURES by Douglas KolackiIn the Great Depression, two brothers find two kinds of escape.